The sophisticated and grand silver hair bat, #2019-19. Hi everyone! I hope you all had a good week. I had a fabulous one because it was a holiday week and it snowed! Snow days are always especially fun! 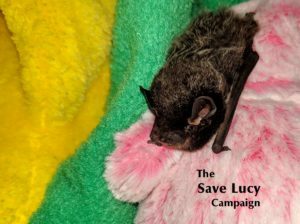 It’s been an exciting week at the Save Lucy Campaign. That’s because there is a cute new rescue. An adorable little Silver Haired bat was rescued a few days ago by the people working at the Hidden Oaks Nature Center in Annandale, VA. The bat is now being cared for by Save Lucy rehabilitators. The bat’s primary caretakers at Save Lucy have generously named him # 2019-19. Bats in rehabilitation are usually given numbers for names. However, seeing as no one wants their name to be a number, I think he needs a better name. Something sophisticated and grand. A name like Sherman! Since our newest addition is a Silver Haired bat, I thought I would write a little bit about them. They have beautiful black or, less commonly, dark brown fur. The hair on their back has lovely silver tips. These bats live throughout the United States and into Canada and Mexico. They haven’t been found anywhere above southeast Alaska though. One interesting fact about the Silver Haired bats is that they are one of the slowest flying bats in North America. If you would like to read more about silver haired bats in Alaska, you can do so here. Previous StorySpring in Louisiana: Love in the air, bats in the gym! Next StoryCan engineering match the agile flap flaps? ?